To begin with, Paul provides an in-depth introduction of the use of Breather Cards, different types of Breathers, patter ideas and justifications and tips on becoming an excellent, seasoned performer. The included tricks and applications are truly mind-boggling to the spectators and The Breather Crimp will provide an easier "path" for a more impossible ending. 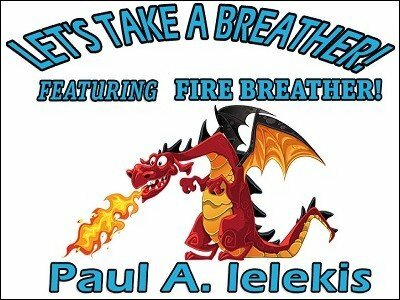 Fire Breather - This is a fantastic 4 ace production that will make you look like a real professional. 1st edition 2016, 20 pages + videos. Here is another outstanding contribution to card magic from Paul Lelekis. Written in Paul's pleasant and easy to grasp style he explores some practical uses for the Breather Crimp. For those new to the Breather Crimp, Paul fully explains this secret device used as a tool to locate cards and aid in the execution of some amazing card magic. The making of the crimp is clearly illustrated and very easy to construct. Paul starts by giving some easy to understand and very practical advice that will help you incorporate the Breather Crimp into your own routines and generally improve your magic overall. As always his advice and performance suggestions are very solid "down to earth" based on real life experience from a person who has as we say in the education field, clearly learned by doing! The routines are all very approachable by the average magician and as with much of Paul's material the impact on the audience far exceeds the technical effort the magician has to put into them. These routines work great and they are comfortable to perform with most of your concentration on the presentation. Take advantage of this opportunity to learn all about this amazing card utility. Here is another solid winner from Paul Lelekis for all of us to benefit from and enjoy!